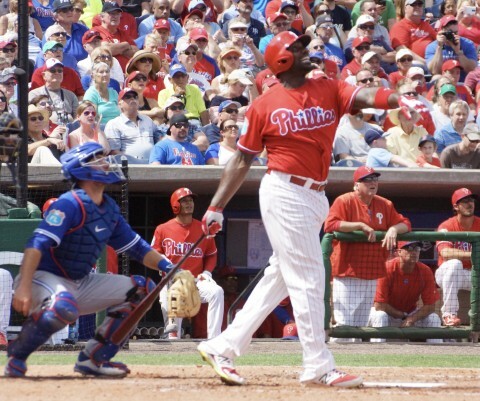 Clearwater, Fla. — A pair of spring training juggernauts did battle Saturday in front of a sellout crowd at Bright House Field in Clearwater, as the Philadelphia Phillies and Toronto Blue Jays entered the game with a combined record of 17-4-3 thus far. The Phillies again rode a strong offensive performance to victory, pounding out 14 hits on the way to topping the Jays 8-5 and recording their ninth win of the spring. Toronto threatened but did not score in the first, thanks in large part to a spectacular running catch by Phillies’ center fielder Odubel Herrera to rob Kevin Pillar of an extra-base hit. The Jays were not to be denied in the second frame, though, as they tallied runs on Michael Saunders’ single and Josh Thole’s groundout. Philadelphia’s David Lough tied the game in the bottom of the third with his first home run of the spring, a two-run shot that plated Carlos Ruiz, who had singled to lead off the frame. Lough was also in the middle of things when Philadelphia took the lead in the bottom of the fifth: he singled, stole second and scored on Herrera’s bloop single to left. 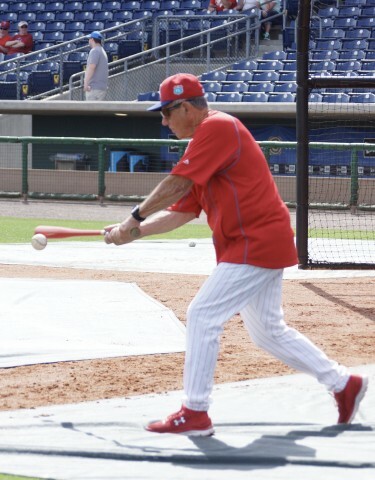 The Phils padded their lead the following inning, when J.P. Arencibia drilled a two-run shot into the bullpen in left field. 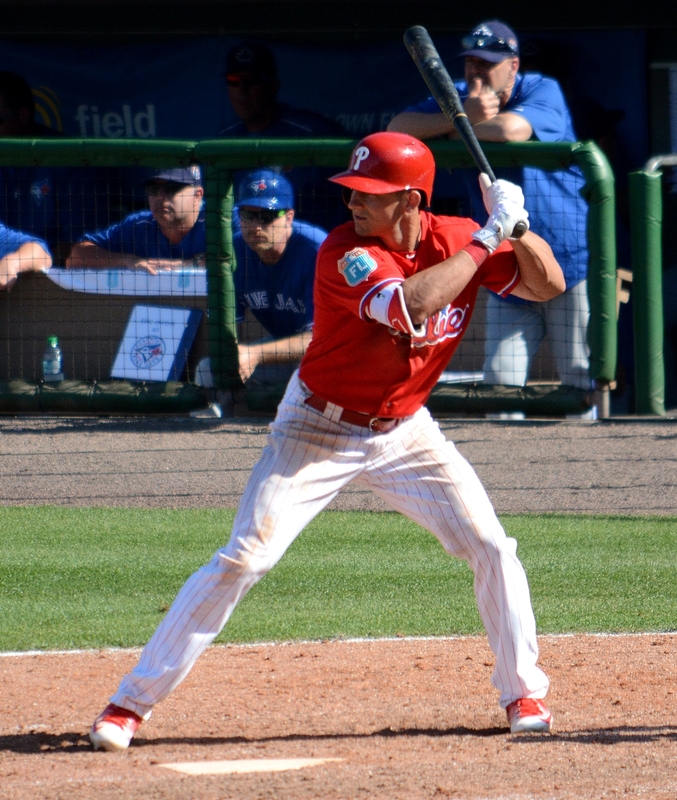 Some sloppy defense by the Phillies helped fuel a Toronto rally in the top of the eighth: Reliever Chris Leroux tossed a wild pitch on strike three to pinch-hitter Jon Berti, and catcher J.P. Arencibia uncorked a wild throw to first that allowed Berti to advance to second. Jio Mier followed with a long two-run homer to left that cut the Philadelphia lead to a single run. The Phillies broke the game open in the bottom of the frame, though, with Nick Williams’ three-run blast the key blow in the inning. The Jays picked up a run in the top of the ninth thanks in large part to a dropped third strike, but Phillies reliever Yoervis Medina was able to quell the Toronto rally. 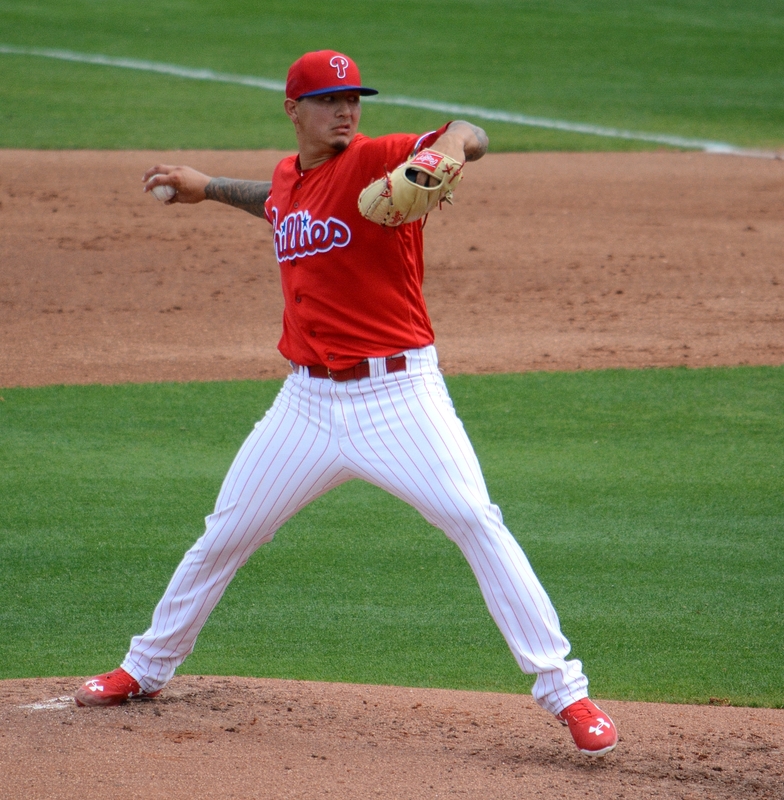 Philadelphia starting pitcher Vince Velasquez struggled through the first two innings, yielding two earned runs on three hits and committing a throwing error. 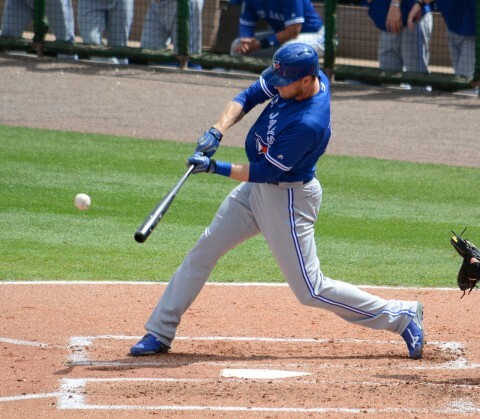 He retired Josh Donaldson, Jose Bautista and Troy Tulowitzki in easy fashion in the third inning, though, and then pitched around Michael Saunders’ double to escape trouble in the fourth. On the day, Velasquez threw 64 pitches, 38 of which were strikes. Offensively, Lough and Arencibia both had nice days at the dish, while Herrera continued his fine start with a pair of hits. Williams only logged one plate appearance, but his three-run blast was the telling blow in the Phils’ victory. 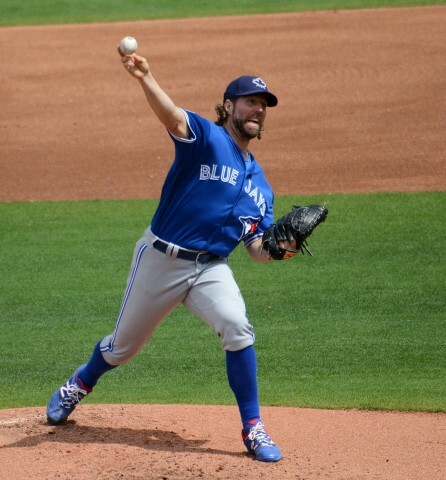 Starting pitcher R.A. Dickey logged a serviceable four and two-thirds of an inning for the Blue Jays; one of the three earned runs he allowed was the result of an inherited runner scoring. On the day, Dickey threw 47 of his 67 pitches for strikes. The veteran knuckleballer figures to be a key part of Toronto’s starting rotation in 2016. Saunders had a solid day at the plate for Toronto, while Mier’s two-run homer pulled the Jays to within a run at the time. The Phillies hit the road for a trio of games and have an off day before returning to Bright House Field on Thursday, March 17 to host the Tampa Bay Rays. 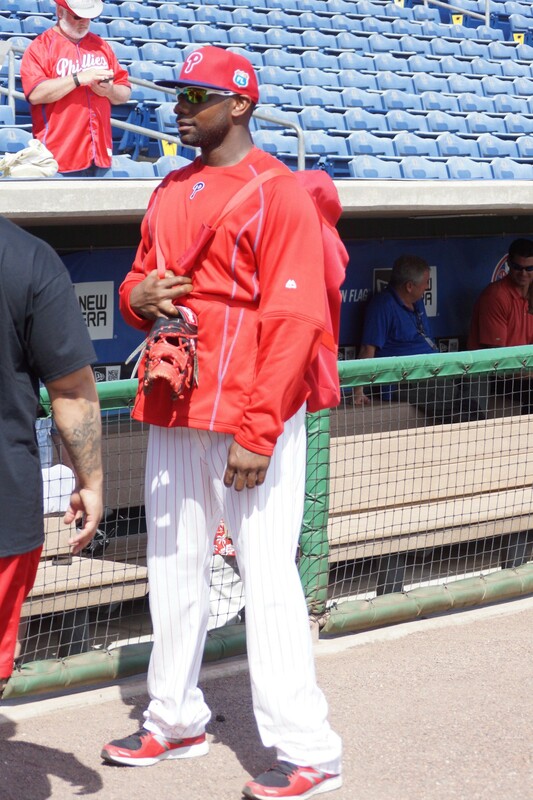 First up for the Phils is a date with the New York Yankees in Tampa on Sunday, March 13, and then it’s on to Sarasota the following day to take on the Baltimore Orioles. LOB--TORONTO 6, PHILADELPHIA 7. 2B--Arencibia, T.
(off Leroux). SB--Sweeney 1 (1), Lough 1 (1). WP--Leroux. HBP--Ruf by Penny. PB--Moore. Tulowitzki, D Adams. PHI: Lough, Goeddel, Franco. BB--TOR: Ceciliani 2, Tulowitzki. T--2:43.